According to Dr. Tracy Buenavista, professor of Asian-American studies at CSUN, many armed personnel were sent to north and west Los Angeles, concerned that the violence would spread to areas like Beverly Hills. However, our popular conception of the events that transpired in 1992 often overlooks the complexity of the riots, leaving us with an oversimplistic narrative of Black criminality and Asian victimhood. This flattening obscures the difficult, and authentically human, stories of those who lived the riot and its aftermath. Now, two filmmakers plan a fresh exploration of the Korean American storeowners’ experiences during the riots in a new short film, called “April’s Way” in reference to the month of April 1992 when the riots began. “April’s Way” stars Tom T. Choi along with a cast that appears to be made up entirely of talented actors of colour. It is a crowd-funded film project that has already raised more than $28,000 since the time of this publication to fund post-production, but it still needs just under $3000 to go before its deadline on November 20, 2015 (go to their Kickstarter to help support this project). I sat down with writer/director Robert Nyerges (R.N.) and producer Matt Hardman (M.H.) to talk about their inspiration in making “April’s Way“. What first drew you to the subject matter of the LA Riots? R.N. : My true interest in the 1992 L.A. riots began back in college when I was taking a class about the history of primetime television. It was here that I learned of how, for the first time, mass media was affecting current events with live news broadcasts. One of the compelling examples I learned of was when a pastor was watching coverage of the initial rioting at Florence and Normandy. He saw a motorist being beaten to death, knew he was only about a block away, ran out of his house, and helped save the motorist’s life. From there I took it upon myself to continue doing research over the next few years. I was amazed by how many different perspectives and stories were left untold. One of the prominent narratives that seemed to be often overlooked or under-told was that of the Korean-Americans, who were largely victims of the whole ordeal, yet frequently vilified by the mass media. It wasn’t until last summer, though, when the protests broke out in Missouri that I decided to take action and bring this story to life. You mention in your NBC interview that the story(s) of Korean American store owners are “often overlooked and undertold”. Why do you think this the case? M.H. : [During coverage of the riots,] the mass media frequently portrayed Korean Americans as violent – firing their weapons at will against possible looters. Most people have seen the iconic images of Korean Americans guarding their stores from rooftops or behind makeshift barricades, but we seldom see the other side of those stories. The truth is that a great number of Korean-owned businesses were destroyed, but the media didn’t cover the long lasting effects this had on the people who had their sole source of subsistence stripped away, or the local communities that became destitute with the loss of resources. No one hears about the tens of thousands of Koreans and Korean Americans who marched peacefully through the streets in an effort to stop the violence. With this project, we don’t necessarily seek to answer the question of why, but rather continue these necessary conversations of social justice that still desperately need to be had. Who or what is the inspiration for your main character, Sung-Min? M.H. : Sung-Min, played perfectly by actor Tom Choi, is a representation of many different Korean-American stories that we came across while conducting research for this project. 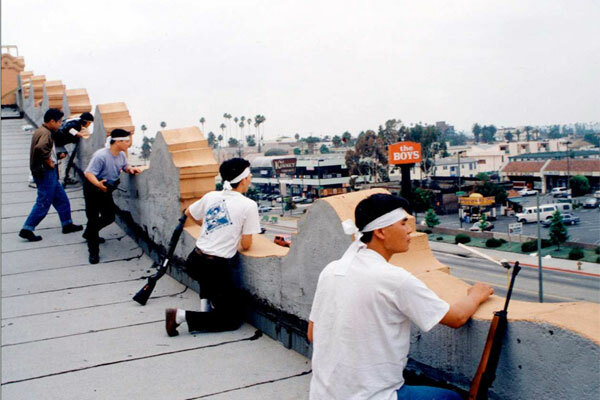 It was important to reflect the many different angles of the Korean-American perspective during the 1992 L.A. riots without explicitly taking allegiance to any one person. Sung is an illustration of many Korean immigrants who have come to America to work hard to build a life and support their families. Like many Korean business owners in Los Angeles during the early 1990s, Sung lives and breathes his responsibilities at his store and knows the importance of its resources to the local community. It would be impossible to encompass all of the details and nuances of so many varying storylines, but all of them helped to influence the character seen in the film. What do you hope viewers will learn or take away with them after viewing “April’s Way”? On a global level, it’s important to remember there were faces behind those flames. For every business that burned down, there’s a family without a livelihood, and many others left without a job and having to travel great lengths just to find everyday needs. Some storeowners chose to leave their property and others chose to defend it. None were villains. There was so much at stake. The LA Riots led to the death of the American Dream for so many families. Yet, beauty can exist in tragedy. There were people who did wonderful things. The family who owned our filming location, which burned down during the riots, loved their community endlessly. They didn’t they quit when that very community destroyed their market. They forgave. They didn’t quit when their insurance company went bankrupt or the state fined them for not cleaning their rubble in time. Instead they forgave, rallied together, and unified. They helped their employees (many African American and Hispanic) gain access to food and jobs at other markets. They continued to donate to the homeless and shelters dedicated to riot victims. They rebuilt their market; their American Dream. Within the April’s Way narrative, it was important to humanize all of the characters involved. We didn’t want to take a biased stance on one demographic versus another. While it is impossible to ignore the violent nature of those tumultuous days in 1992, we were careful not to villainize any one person. For example, an African American mother is seen stealing food, however, she is doing it out of a need for survival and to feed her young daughter. There is a pair of young African American guys who pull a gun on the Korean store owner, but rather than portraying them as stereotypical and malicious, they are simply misguided youths making a rash decision in the heat of the moment. Our Korean store owner even gets heated and goes to get his gun, but when he realizes the severity of his actions, he stops, realizing violence is the wrong approach. It is important to see that all of these characters, although doing something “wrong” so to speak, are actually following their moral compass, ultimately choosing the nonviolent approach. Do you see relevance between the subject matter of “April’s Way” and the current political climate? If so, what connections do you hope viewers will draw? April’s Way is disgustingly relevant, despite taking place in 1992. On the surface, the film follows a Korean storeowner as he defends his market and protects his family. We’ve learned, through various personal relationships, interviews, and watching other films, that some Koreans in Los Angeles still feel their voice is unheard or that others don’t understand their culture. Since the riots, Koreans have recognized some weaknesses and began to combat this, by raising their voice in community organizations/foundations, and even in politics. This is bigger than one store owner or even one culture being targeted. Unfortunately, every element leading up to and throughout the Los Angeles Race Riots of 1992 is still seen across the country today. Whether it’s police brutality, racism, hate crimes, violence, rioting, etc, each of these are still happening. Everyone needs to make strides to improve themselves and how they understand others. One solution has been presented to us time and time again – communicate. With communication, comes a decrease in violence, and an increase in understanding or compromise. Art, and specifically film is one way to share stories and improve the communication. With April’s Way, we hope to inspire a deeper level of critical thinking and to remember when watching the news there are real life people, like our character Sung-Min, at the core. We’ve witnessed progress, but recent tragedies in Ferguson and Baltimore are proof we are nowhere close. How can readers help support this project? Readers can support in many ways! The biggest is by heading to our Kickstarter. There you’ll find much more information about the project and our journey of telling this story. We’ve met so many wonderful people along the way! In our situation, Kickstarter works very well, as it allows us to engage with an audience and build a community to further continue the conversation of social injustices. Also, sharing is just as helpful as financial contributions! Please spread the word by posting to your social media, liking us on Facebook, share your memories of the riots, and most importantly reflect on what we’ve learned as a society and what we haven’t. We challenge our audience to “#LeadTheWay,” meaning lead by example in day to day life. It’s terrible this film about 1992 looks so similar to headlines of today, but if we start with tiny, positive actions in our day to day lives, followed up by sharing stories such as April’s Way, we can combat the misrepresentation of the Korean perspective, as well as racism that is still so prevalent. Thank you to all reading this, we look forward to making progress together! Act Now! There is less than 48 hours left to donate to “April’s Way” to help make this project a reality. Please take a few minutes to pledge to this project, and to share this post. You can also follow the film on Twitter at @aprilswayfilm.